How and why did American business seek to eliminate competition. As business expanded natural predatory instincts took over as companies sought to eliminate competition. It was survival of the fittest in an economy which did not regulate business - laissez faire, social Darwinism, rugged individualism where the themes of the day. Clearly the natural conclusion of laissez faire capitalism, or pure competition, is the end of competition itself. It is the natural goal of any business to make as much profit as it can and to eliminate its competition. When a corporation eliminates its competition it becomes what is known as a "monopoly." Monopolies took several organization forms including what were known as trusts. Stockholders of several competing corporations turn in their stock to trustees in exchange for a trust certificate entitling them to a dividend. Trustees ran the companies as if they were one. 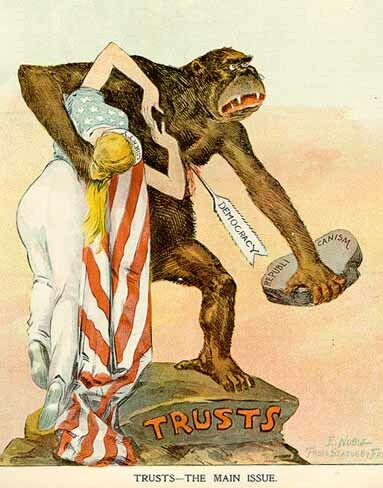 This political cartoon published The Verdict on July 10, 1899 by C. Gordon Moffat shows an America controlled by the trusts. To the public all monopolies were known simply as "trusts." These trusts has an enormous impact on the American economy. They became huge economic and political forces. They were able to manipulate price and quality without regard for the laws of supply and demand. Basic economic principles no longer applied They also had great political power. Trusts were extremely influential in Congress and in the Senate. Some even accused the trusts of "buying" votes. Although many Americans still regarded men like John D. Rockefeller as "Captains of Industry," more and more people began to publicly question the tactics of the "Robber Barons." As trusts grew ever more powerful and wealth became concentrated in fewer and fewer hands, animosity towards the new businessmen and the new methods of doing business increased tremendously.